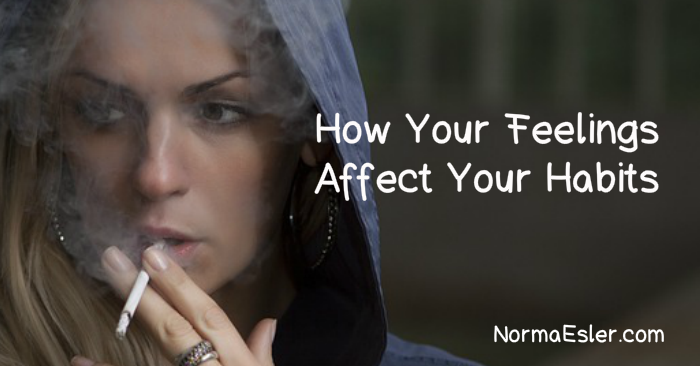 Have you ever noticed how your feelings affect your habits every day? It’s even true that feeling a certain way can BECOME a habit. And these habits can have an effect on your life even if you aren’t aware of it. For example if you grew up in a home where your parents always argued, you may develop a fear of relationships. You may think it is perfectly normal for adults to constantly argue. If you have been surrounded by money issues, then this subject can always make you fearful or angry. A habit is just a set of steps that you do repeatedly, so you can see how negative feelings and thoughts can affect this. A child may grow up expecting that they will never have money. So they don’t bother taking steps to counteract this. Instead of learning how to save or budget, they accept that they won’t have money when they are older. Don’t let your feelings hold you back. The point here is to not let your negative feelings affect your efforts into trying to make changes. First you have to understand what it is you want out of life. Do you want to own your first home? Do you want to have a happy marriage? Or do you want to go to college? Whatever your goal is write it down and then figure out the steps you need to achieve this. How much money you need for a down payment for a home, for example. Then start thinking good thoughts about your choice. Be positive that you will save enough for your down payment. That you will get accepted into the college of your choice, or find the person of your dreams. Now that you have a plan of action you need to form the habits to achieve your goals. This can include learning how to put money aside weekly. Or it might involve taking a night class so you can get accepted to college. As you start doing these things repeatedly they will become part of your daily routine, and will form a habit. Before you know it you will be saving regularly without thinking twice. Losing weight requires the forming of new habits. You need to eat smaller portions of healthier food to achieve your weight loss goals. You may have already tried to lose weight unsuccessfully. This usually happens because your mindset is not positive. You may think that you will never lose those 20 pounds or that you will still feel the same as you do now. If you can get past these negative feelings and turn them into positive ones, your chances of success will improve. Start thinking about how great you will feel when you can fit into that little black dress again. So if you aren’t that happy with your current life, start working on changing the way you feel about yourself, and about others. Understanding how your feelings affect your habits can lead to huge improvements in your life.